Today in Masonic History William Pierce Frye is born in 1830. William Pierce Frye was an American politician. Frye was born in Lewiston, Maine on September 2nd, 1830. He attended public schools in Androscoggin County, where Lewiston is located, before going on to Bowdoin College in Brunswick, Maine. He graduated from Bowdoin in 1850. He went on to study law and was admitted to the bar. Frye began practicing law in Rockland, Maine in 1853. Eventually he returned to Lewiston where he continued to practice law. Frye played a role in founding Bates College in Lewiston and served as a trustee. In 1881 he received a Doctor of Laws (LL.D) from Bates. In 1861, Frye was elected to the Maine House of Representatives. He served until 1862 and was reelected in 1867. In 1866 he was elected as the Mayor of Lewiston, serving until 1867. It was in 1867, that Frye was elected the Maine state Attorney General. He served as Attorney General until 1869. In 1870, Frye was elected to the United States House of Representatives. He served in the House of Representatives until 1881 when he resigned after being elected to fill the vacated seat in the United States Senate. 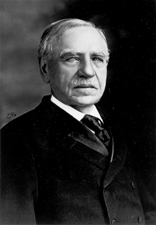 Frye served for 30 years in the United States Senate until 1911. During his time in the Senate, Frye spent more than have his time as the President pro tempore of the Senate. He served longer in that position than any of his predecessors. During his time President pro tempore, the position of Vice President was vacant twice. This left Frye as the leader of the Senate. The first time was when Vice President Garret Hobart died in office. The second was when Theodore Roosevelt succeeded to the Presidency. Frye resigned as President pro tempore as his health began to fail a few months before he passed away. Frye passed away on August 8th, 1911. Frye was a member of Ashlar Lodge No. 105 in Lewiston, Maine.